Before I started working at ScoutComms in August last year, I had very little experience with the military community. My aunt is a veteran, who previously deployed to Afghanistan, but conversations with her during the holidays were the extent of my interaction with the military community. Having spent the last 12 months working intimately within the military community, I learned that there is a major gap between former service members and civilians. It’s a gap that most of us do not even realize exists. My job involves a lot of phone calls and a lot of emails, but it takes more than knowing the ins and outs of our work to do our job well. We have to find where our work fits in the big picture, and communicate that to our veterans and their families. By staying up to date with current veterans’ issues, working alongside veterans, and learning more about how they are assets to our community, I feel better equipped to help do my part in helping close that gap. Whether it is with a cousin, aunt, great-uncle or family friend, take the opportunity to have a friendly and engaged conversation with the veterans in your life. Let the veteran be the first to bring up private or personal subjects, but don’t feel like you have to shy away from their service. The more we engage, the easier it becomes to see them as a human being just like ourselves. Often times TV shows and movies portray veterans as damaged and broken heroes, when in reality the majority of veterans are doing well. This by no means discredits the validity of those that are recovering from serious physical, mental, and moral injuries. However, it is important to know that the majority of service members could use support in other, often less traditional, ways than we’ve seen in the past. In September, I had the pleasure of attending the KISS rock concert in Richmond, VA as a part of the Hiring Our Heroes: Roadie for a Day program and Vet Tix’s Hero’s Wish program. 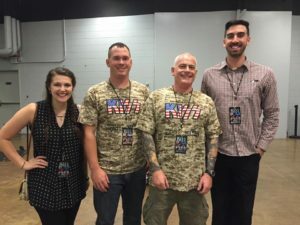 I met James and Warren, two local Virginia veterans who had their lifetime dreams come true as they met the band one-on-one during a VIP event and again when their service was recognized on stage in front of thousands of people during the show. Witnessing moments like that remind me that sometimes it’s little things like this that go a long way and can change a person’s life for the better. A great way any civilian can meet veterans in their community is through joining their local Team Red, White and Blue chapter. Team RWB is national organization that bridges the civilian-military divide by bringing veterans and civilians together through events that promote active lifestyles, and community service. Volunteering is a great way to get involved in the military community. There are plenty of opportunities to volunteer at ranging from local races benefiting veteran charities, or lending a hand to help a local community’s Veterans Day ceremony go off without a hitch. These are opportunities to surround yourself with veterans and the military community, much more so than you would find volunteering elsewhere. Try standing shoulder to shoulder, and commit a few hours of time working towards a mission, together. Team Rubicon is an emergency response organization that deploys veteran and civilian volunteers to help with clean up and restoration efforts after natural disasters. They have organized major cleanup efforts for areas effected this year by Hurricane Matthew, and the historic flooding in Texas. They also organize community projects that help benefit specific needs in each region. Team Rubicon is an organization I personally look forward to volunteering for in the future. Read the news concerning veterans’ issues. Keep your ear to ground, or subscribe to weekly newsletters that do that for you. Freshen up your news stream by reading an article from Military Times or Task & Purpose a few times each week. By following these news sources, I am able to follow the development of new issues as they happen, like the ban of transgender service members in the military that was recently lifted, and the fight over federally funded in vitro fertilization for veterans with service related injuries that prevent them from starting a family. Policies and the passing of laws aren’t stories that happen overnight. When we follow the issues, both big and small, it gives us a sense of where the priorities are. Additionally, The Military Times Early Bird Brief and the Stars and Stripes Daily headlines are just two daily email newsletters that keep subscribers up to date. If you are inclined to use social media finding those same news organizations is great for this too. Civilians: let’s do something different. Let’s listen and learn about the large issues, and the smaller ones too, that members of the military community face. Let’s ask the questions that need to be asked. Let’s talk about them and advocate for solutions that demonstrate real change. Let’s put in the effort and give our veterans better a better future that we can all be proud of having a hand in.